Confession: before I started this project I did not own a fisheye and considered it a gimmick. I thought all fish eye images look the same: a round ball with gushy stuff inside it. I bought the fisheye in order to bring bracketing of focal length to its logical conclusion. But I fell in love with the dang thing, and rarely go anywhere without it anymore. In a strange way, it is kind of a normal lens. When we look out at the world we see almost 180 degrees wide, although things are pretty fuzzy and vague at the edges, which is kind of how the fisheye sees the world. Since it is an extreme, it can help us to understand concepts like angle of view and depth of field. It is more fun than a barrel of monkeys. I suspect an ultimate experience might be to be IN a barrel of monkeys — with a fisheye. Bottom Line: Maybe you should rent a fisheye for a weekend before you dismiss it as a gimmick, like I did for 40 years. If you still dismiss it, okay. By the way, I often crop my fisheye shots to round in a white rectangle rather than in a black rectangle, which I find overwhelms the image. 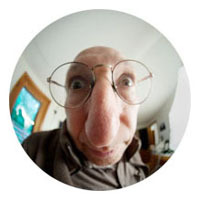 This is your basic out-of-control fisheye image, the sort of image that gives "the fish" a bad name. But it IS an eye-catching effect, is it not? Your subject HAS to have a sense of humor to appreciate this kind of thing. But I email a photo of myself like this when I need to inject some humor into a situation — the results are remarkable. Here, we are looking straight up at Nicole, while lying on the ground in the woods. Not only can you see the forest on all sides, but you can also see Bell, Nicole's dog as she walks up the right side of the frame, sniffing her way around the edge of reality. Whereas in this photo we have stacked Nicole and Bell on two layers. This shows how you can get the horizon to be straight across - only if you hold the fisheye lens level, not pointed up or down. But if you tilt the camera down, the horizon bends drastically, which you must either use as part of your concept, or shoot another way. Note the feet and camera strap at the bottom of the photo. Shooting your feet and tripod are constant issues with working with 180 fisheye. This demonstrates that if you don't let the subject get too close, the fisheye can be used as just a very wide angle lens. It shows the subject fully surrounded by the environment, which can be critical to a photo. And you can CAN crop out the circle and still get much of the same effect. If you ask the subject to lean in, towards the camera, you start to isolate the head from the body in a very cartoonish way. If the subjects bends towards you, AND you get very close you can get an extreme cartoon look, and you should always consider the extreme of any creative variable, even if you then back off - literally, in this case.